While graduating students Segenthave Senthan and Hari Sathasivanathan are excited to be moving on to the next stage of their educational journey they will miss their School Resource Officer Constable Melinda Mantle. Mantle has been at Lester B. Pearson Collegiate Institute for the last three years serving as a mentor to many students. The 42 Division 2016 Officer of the Year is among four officers assigned to five schools in the division. Sathasivanathan said it has been a pleasure having Mantle in his school. “With her around, the school is a safe place,” he pointed out. 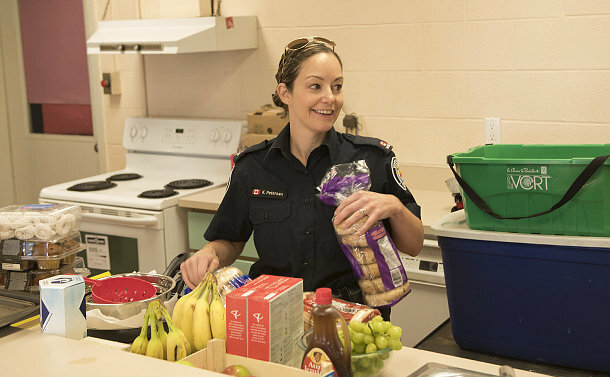 Since being posted to the Scarborough school three years ago, Mantle began bringing other officers in around Christmas and at the end of the year to serve food and meet students. Superintendent Kim Yeandle and Staff Sergeant Andy Ecklund joined Mantle and other officers on June 8 to make breakfast for the students at their school. 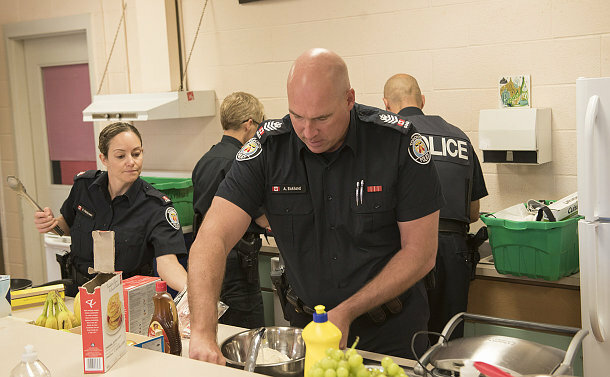 The officers prepared waffles, eggs, bacon, pancakes and muffins. The school’s breakfast program was launched 12 years ago. The breakfast program runs three days a week. Mantle, whose father Larry Mantle retired from the Service in 2015 after nearly four decades on the job, relishes her role at the school. Yeandle, who helped prepare pancakes, said the SROs play a vital role in the schools. “They build relationships with the young people and that’s one of the most important things we can do as police officers,” she said. 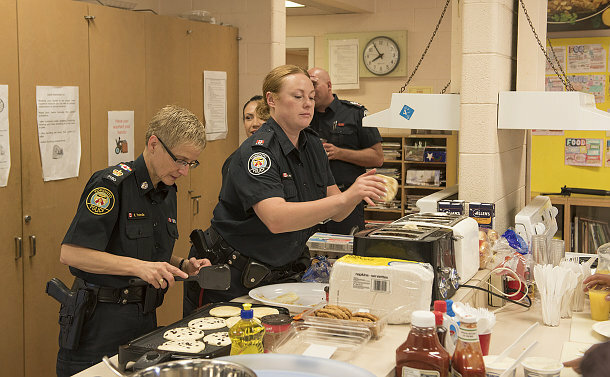 Constables Stevan Tanouye, Kathleen Petersen, Michael Burleau and Claudia Bednarczyk also helped prepared breakfast for the students.